A gearbox contains a great many moving parts. Some of them are submerged in oil and some of them are splashed — that is, the oil is carried to them by other moving parts. The lubrication is designed to prevent metal-to-metal contact, between teeth on gears, for example. The type of oil used depends partly on the type of gears the manufacturer has designed into the gearbox. As in the engine, the oil must be able to withstand high temperatures. 'Extreme pressure' additives in some gearbox oils act as solid lubricants on gear teeth when temperature rises above the safe limit of ordinary oils. The gearbox oil level should not drop noticeably between routine oil changes about every 30,000 miles (50,000 km). If you have to add a lot to correct the level, check carefully for leaks (See ). Stand the car on level ground before you check the gearbox oil level. On most cars the filler plug on the side of the gearbox acts as the oil-level indicator, but a few cars have a gearbox dipstick. The typical layout has the gearbox behind the engine and beneath the floor. Some gearboxes have a dipstick instead of the usual filler-and-level plug. Normally you reach the plug from beneath the car. Clean round the area before removing the plug, to avoid letting dirt in the hole. Marks on the gearbox dipstick show the recommended upper and lower limits for the oil level. Pull out the dipstick and wipe it on a clean rag. Replace it, then remove it again to read the oil level. If it is too low, top up to the upper limit with the correct grade of oil — as specified in the car handbook. Some cars — the Mini and Metro for example — have a common oil supply to engine, gearbox and final drive. The oil level for the whole system is checked with the engine dipstick. Keep the oil up to the upper limit shown on the dipstick, but be careful not to top up beyond this mark. If you have the more usual filler-and-level plug on the side of the gearbox, consult your car handbook to identify it correctly. The side of the gearbox may have other plugs on it to cover adjustment points, for example. With the car level, remove the filler/level plug. The oil should be level with the bottom of the plug hole. 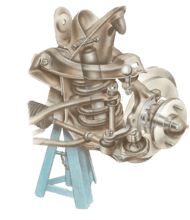 To remove the plug, reach through the engine bay, or jack up the car, support it level on axle stands at front and rear, and lie underneath the gearbox. More rarely, you can reach the plug through an inspection hole in the car floor beneath the carpet. Depending on its type, the plug unscrews with an open spanner, a large, hexagonal Allen key, or a square-ended key. Some cars need a special tool that can be bought from a main dealer for the make of car. Multi-headed drain-plug or sump-plug wrenches that remove gearbox, axle and sump plugs are sold in accessory shops, but look to see exactly what you need before you buy one. Wipe the area round the plug with a rag to clean away any grit, then take out the plug. The oil should be level with the bottom of the filler hole. If you cannot get a clear view into the hole, push a fingertip in. You can feel the oil when the level is correct. If the level is too low, top up until oil begins to flow out of the hole. Some gearboxes use engine oil, others use hypoid oil. It is important to use only the correct type and grade. Your car handbook will specify what these are. The hole may be in an awkward position. Reach it with a plastic bottle fitted with a flexible tube through which you can squeeze the oil. Oil is sold in such containers, as well as in larger tin cans. The plug often has a washer. Examine it and renew it if it is distorted, split or leaking. Replace the plug, taking care not to overtighten it. Gearbox casings are usually alloy and can crack. Clean the area before you remove the plug, so that grit does not fall through the hole. Many plugs unscrew with an Allen key. It is best to drain the oil just after a run, when it is warm and flows out quickly. Put the car on level ground, and make sure that you have enough new oil of the correct type for refilling. To remove the drain plug, which is underneath the gearbox, use only a properly fitting tool so that you do not damage the plug. The plug may be the same size as the filler plug. Some plugs unscrew with a spanner. Always use the correct tool for the plug or it will become damaged and difficult to screw back again. Sometimes there are two drain plugs, because of a baffle plate across the inside of the gearbox. Clean around the plug or plugs before you remove them. Put a container under the drain hole - large enough to take all the oil. You can use a 5 litre oil can laid on one side with the other side opened; or use one of the special containers that can be sealed afterwards for carrying the oil for disposal. Loosen the filler plug to make sure it has not seized and that you will be able to refill. Have some rag handy to soak up any splashes. Take out the drain plug. When the oil flow has slowed to a drip, put a finger in the drain hole and hook out any metal particles or other debris. Any significant amount of metal debris indicates trouble inside the gearbox, and you should consult a garage. If the drain plug has a washer, fit a new one. Replace the plug firmly, but do not overtighten it. Squeeze oil from a soft plastic bottle fitted with a flexible tube into the filler hole, which is often hard to reach. Some cars need a long tube. In cold weather, keep the oil warm for quicker filling. Fill to the correct level with the new oil and refit the filler plug. Use the oil specified by the car manufacturer; there is little gain in using a cheaper oil, since oil changes are at long intervals, perhaps after every 30,000 miles (50,000 km). Some gearboxes do not have a drain plug, only a filler-and-level plug for topping up. To replace the oil in this type of gearbox, use a syringe to draw the old oil out, then refill in the normal way. The drain plug often has a sealing washer - if damaged it may leak. Jack up the end of the car where the gearbox is fitted, and support it on axle stands. Chock the wheels remaining on the ground. Apply the handbrake if you jack the front end. Road dirt may hide a leak, so that the first sign you notice is a low gearbox level during a routine check. If the oil level has dropped, and you cannot immediately see the leak, top up then clean the whole gearbox with a proprietary degreaser. Drive the car a few miles then look for the leak again. Usually a leak is from an oil seal, gasket or sealing washer. Damage to the casing is seldom the cause. Examine all the inspection plates. Occasionally their gaskets deteriorate and cause leaks. The filler plug may leak because of a damaged sealing washer or thread. There are gaskets under inspection plates, which leak occasionally if the plate has been removed and refitted badly. Some plates can be reached only by removing the gearbox, a task best left to a garage. Other plates are more easily reached. Drain the gearbox oil and unscrew the inspection plate. Clean off the remains of the old gasket. Do not scratch the metal; scratches can prevent a proper seal being made later. Smear both faces with gasket sealant and lay the new gasket in place. Refit the plate, check that the gasket is straight, and tighten the screws evenly. Refill with oil. A leak at the filler plug or drain plug is probably due to a damaged sealing washer. Fitting a new one should cure the leak. If it does not, the threads may be damaged. Making a new thread is best left to a garage. The oil seal where the speedometer cable enters the gearbox sometimes fails. Fit a new one (See Fitting a new speedometer cable). 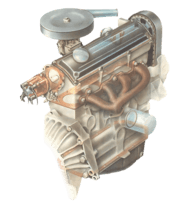 A leak at the front end of the gearbox may come from damaged seals in either the engine or the gearbox, or a gasket between the gearbox and the clutch bell housing. Such a leak often drips from the bottom of the bell housing. Such leaks must be repaired; if they suddenly get worse, severe damage could result. To replace these seals the gearbox must be removed - a job for a garage. Check for a leak at the rear of the extension housing. It is usually caused by a damaged oil seal. Disconnect the propeller shaft and fit a new seal. On a front-wheel-drive car, check the seals at the drive shafts. On a rear-wheel-drive car check the rear end of the gearbox. A leak here usually comes from a failed extension-housing oil seal. You can disconnect the propeller shaft to renew this (See Replacing transmission oil seals). On a front-wheel-drive car, check the oil seals at the drive shafts for leaks (See How to check U-Joints). The gasket between the main gearbox and the extension housing is unlikely to fail, but fit a new one as a matter of course if you separate the two housings.